Information about the graduation marquees. 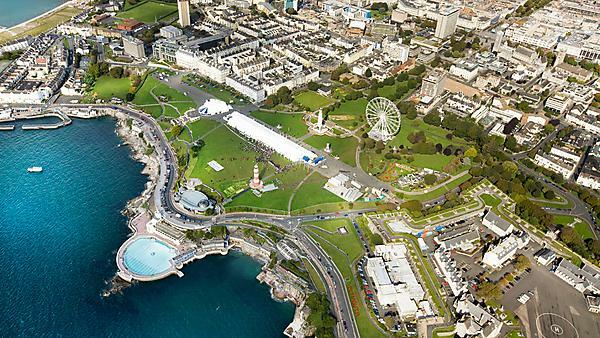 For the eighth year running, the University of Plymouth is holding its annual graduation ceremonies on Plymouth Hoe. We are delighted to be working with Plymouth City Council to showcase the city of Plymouth in this way. The ceremonies will be held on the Hoe promenade (near Smeaton's Tower) in two large marquees which will be fully dressed inside and which will provide a breathtaking backdrop for the graduation celebrations. Both of the marquees are located close together on the Hoe promenade. Only students are permitted in the robing area but family members can meet you in the photography area. Academic robe return will also be located here. This area is situated between robing and photography and the main ceremony area. There is a licensed café selling tea, coffee and a small selection of alcoholic beverages and snacks for pre-ceremony refreshments. There is also some seating here. Ceremony tickets can be collected from the ticket table located in the graduation lounge. Student seating plans will be displayed here. Details of special arrangements you may have requested will also be available here. At 1,250 square metres this is the largest area and seats 1,200 people. Once robed and photographed you should aim to be seated in the graduation hall no later than 15 minutes prior to the start of your ceremony. You must sit in the seat allocated to you on the seating plan. Guest seating is unreserved, with the exception of those who have requested special arrangements. Details of any reserved guest seating will be displayed on seating plans. The post-ceremony reception will be held in a large marquee next to the graduation hall. This location gives you stunning views over Plymouth Sound. You'll be able to enjoy a glass of sparkling wine and canapés, which are included in the ticket price, whilst mingling informally with members of academic staff from the schools and departments. A selection of gluten-free canapés will also be available. Please ask the waiting staff. We are unable to operate a cloakroom service at the ceremonies. Please keep all belongings with you. These will not be permitted in the graduation hall where the ceremonies take place but they may be left in the entrance foyer. There is a café selling refreshments in the graduation lounge.